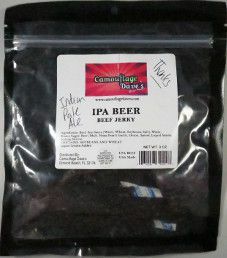 The next review on Camouflage Dave’s will be on a 3 ounce/85 gram bag of their India Pale Ale (IPA) Beer flavored beef jerky. This jerky was kindly submitted for review by the founder, Dave Porton. 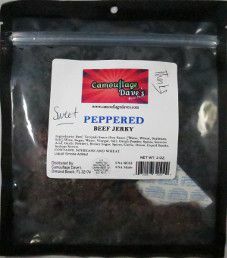 The first review on Camouflage Dave’s will be on a 3 ounce/85 gram bag of their sweet peppered beef jerky. This jerky was kindly submitted for review by the founder, Dave Porton.